PRODUCT DESCRIPTION: Concentrate that is mixed with water and applied to surfaces which have mold/fungus/mildew growth. It will both kill off the growing mold as well as control the musty odor associated with the growth. WHERE TO USE IT: Basically anywhere. It is labeled for use on all kinds of porous and non-porous surfaces. This includes but is not limited to counter tops, appliances, carpets, walls, tiles, hardwood floors, dirt, concrete, brick, stucco, wood, plastic, vinyl and basically anything which has mold or odor problems prevalent. Excellent material for use on brick which needs to be cleaned prior to other treatments, this product is great for those “musty” areas of damp rooms where unpleasant odors arise throughout the year during certain times. If you are uncertain or concerned about staining, it is suggested that you apply some to a “test” area where you want to treat and let it sit to see if any staining or discoloration occurs. Do this prior to treating the whole area. 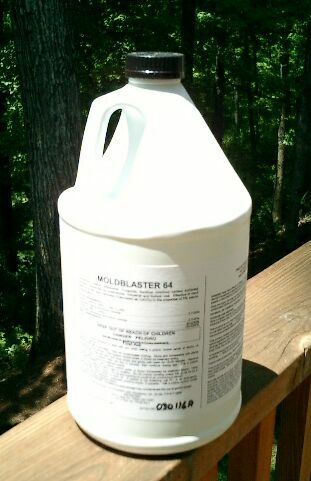 RATE OF APPLICATION: Add 2 ounces per gallon of water and use this mix to clean 100-300 sq/ft, depending on level of growth. This product should be left to sit at least 10 minutes when applied to get the best results; if treating crawl spaces or attics, just lightly mist and leave it be. This product can be sponged on surfaces, sprayed or misted using our fogging machine. Use as often as needed. This material is not intended to provide lasting residual so if used alone you will have to apply it often. However, if our other line of mold and fungus blockers and equipment are both used and installed, use of this material will be seldom needed.